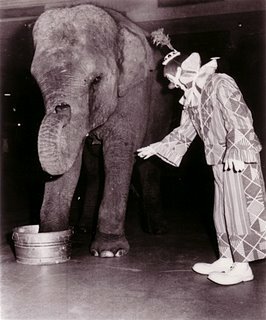 This photo of Otto is from 1968. I was in second grade at the time. I started writing Clown College about that time requesting info about how to apply as well as begging for autographs from clowns. I got one from Otto first, and later one came from Coco that same year. I think the Coco photo is still at my folk's house in Greensboro. I will send you that when I can find it. 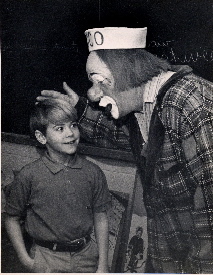 The other one is from 1970, I was in 4th grade and Coco, advance clown at the time, actually came to my school to visit me. 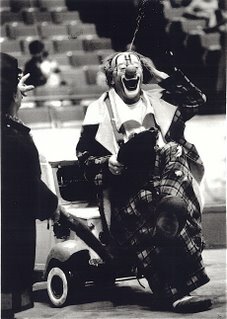 I think this was cooked up by my mother, the promoter and the GM of the Greensboro Coliseum who new me and my family by then because I had become a fixture around the building and train yard when the circus came to town. It was a wonderful surprise for the "shortest kid in school" and the turning point in my academic career. 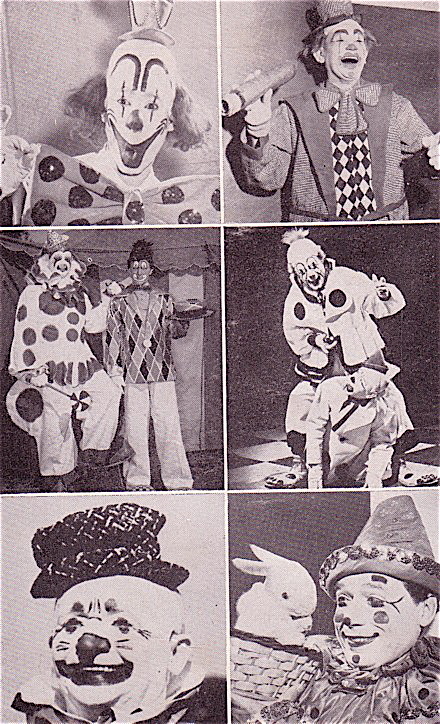 I was convinced that Clown College was where I wanted to get my "edumacation." Coco encouraged me to stay in school, however, (as a former advance clown, I guess that's what you're supposed to say to a kid) .... and go to college before trying to go to Clown College. But, being the rebel I was, I didn't heed his advice. I attended CC in 1978 right after high school and then to college after my stint with the Blue Show. Maybe that's what fate had in store for me though. Doubts yes..... regrets no! 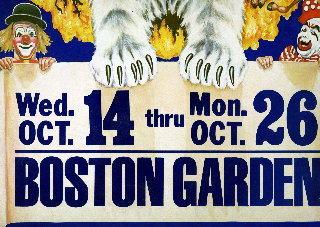 I'm only including the poster shot so you'll know what I looked like back in the 1900's. I was very humbled and honored to be included on the 110th edition poster with Prince Paul! Not sure I was worthy at the time... but it didn't stink! :-) I need to get a bigger scanner and I'm embarrassed that Prince isn't cropped very well. 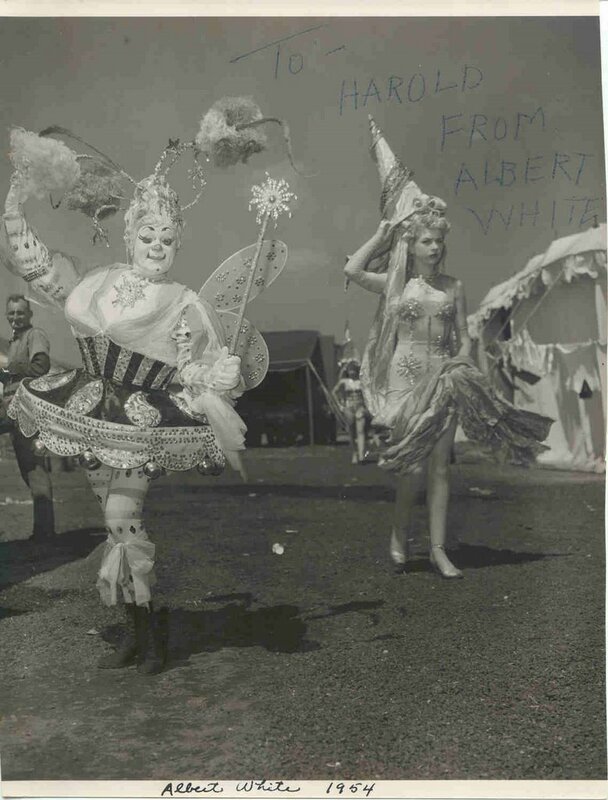 I can't count the number of times I made my Dad drive up and down the road that ran parallel to the train yard where the circus train parked in the hopes of catching a glimpse of a "real" circus performer. That was always the highlight of the new year in February..... and it definitely helped to brighten a kid up with the post Christmas blues. 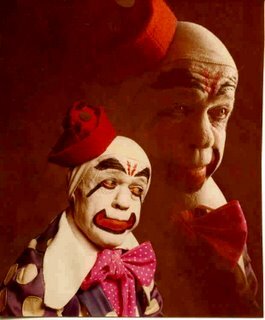 I lost my dad this summer and I'm so thankful for those days when we got to dream together about the things that kids like to dream about...... like, running away and joining the circus! What great memories your website has brought to mind. Thank you Pat. Thank you Jeff, for sharing your wonderful memories and photos and our deepest sympathies in the loss of your father. The 116th edition Ringling Blue Unit Alley. Among the stars we see Tuba Heatherton, Sam Drummond, Chris Hudert, Tammy and Tom Parrish, Tricia Manuel (now Bothun), "Mr. Bill" Machtel, David Kiser, Jimmy Graham, Huel Speight and Jon Weiss. 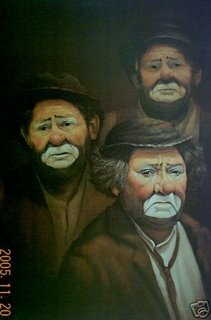 My apologies to anyone that I didn't identfy. Can anyone out there fill in the blanks? I'm not sure who the hairy-armed wife is but the husband is the extremely gifted Rocco Paris from the 119th edition Ringling Red. 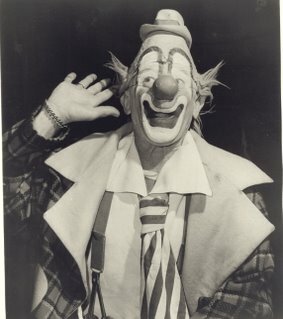 Clowns were awarded, and the act won a Bronze Clown. handles the lighting for Germany's Cirkus Krone. who started out as riders. just as much since Angelo retired. Clearly the clip is cut to fit a 5 minute slot. not recognise, but he plays his part very well. A side-by-side comparison of an early makeup by Ernie Burch and his classic Blinko makeup. 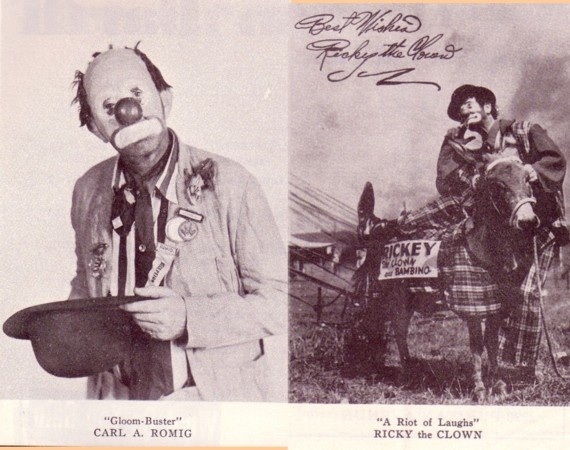 The weird thing is that Ernie always claimed that his nickname "Blinko" was given to him by Cecil B. DeMille during the filming of THE GREATEST SHOW ON EARTH. 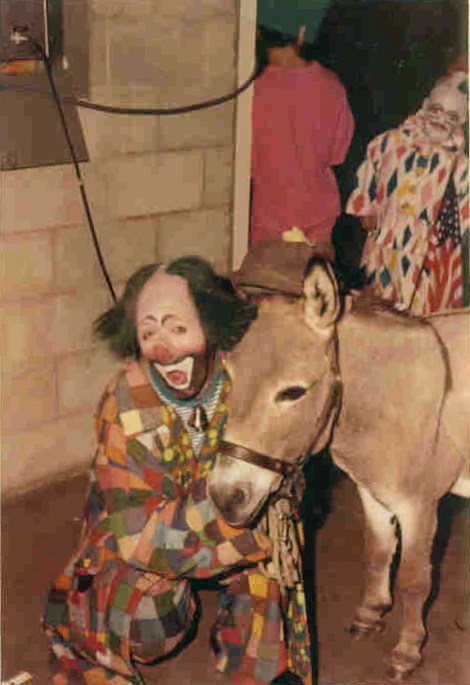 Either this is an old photo that was re-used in a program after Ernie had adopted the monniker or the nickname pre-dates Ernie' s appearance in the film. 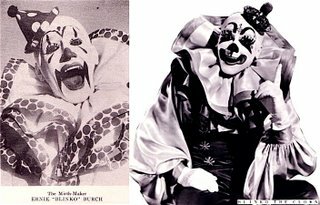 Either way, by my latest estimate, Ernie Burch must have gone through just under 6,500 different makeups before finally settling on the face he's best remembered for. 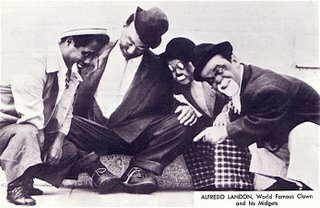 Alfredo Landon and his Politically Incorrect Act Description: featuring Nino, Victor (we're trying to get last names for these two fine gentlemen) along with the man in Lou's Baby Carriage, the driver of Lou's Water Skiing speedboat, direct from Chile...Mr. Mike Padilla. 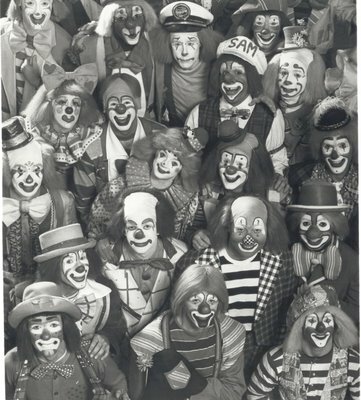 Clockwise starting top left: Javier "Peluza" Esparza, George "Sonny" Riley, The Sherman Brothers, Big Chess (Chester), & JoJo (Joe Vanni), Li'l Johnny ( John Cirillino), Acky (Al Ackerman, former acrobat) and Jimbo( James "Jimmy" Douglass) & Flip (Arthur Gallagher). Has anyone out there in Vegas come across Peluza yet? 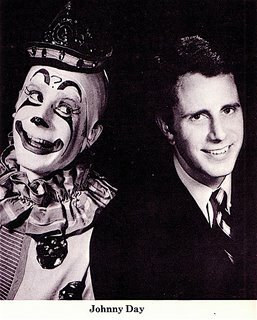 Lou's late 60s/early 70s headshot, used extensively in the early days of the Feld stewardship of the show. 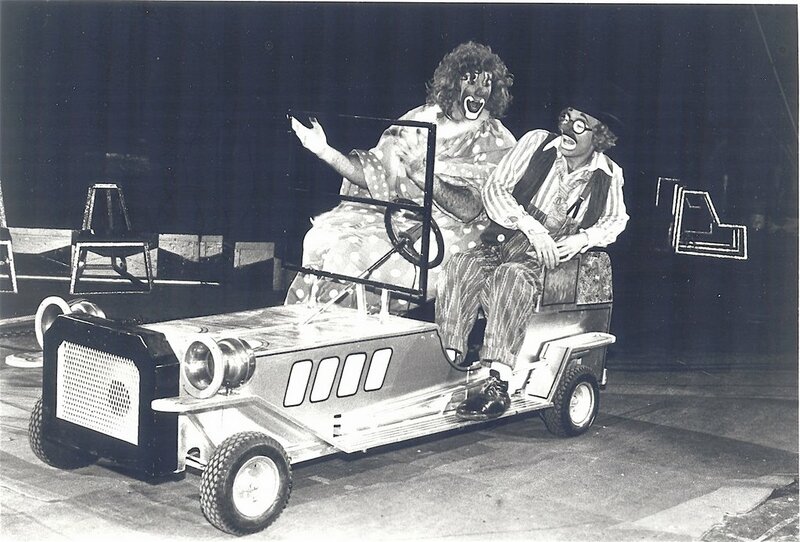 Lou in a classic moment from the car gag captured for a promo photo for the 1975 Bicentennial edition of the show. 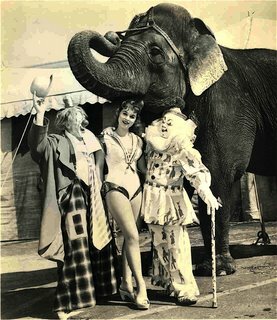 Clowns, Showgirls and Elephants: Lou Jacobs, Kelly Ann Holmes, Albert White posing in front of the Mighty Minyak. Former diesel truck mechanic, three time Golden Gloves Middleweight champion and WW2 Navy Seal...Mr. Albert "Flo" White. 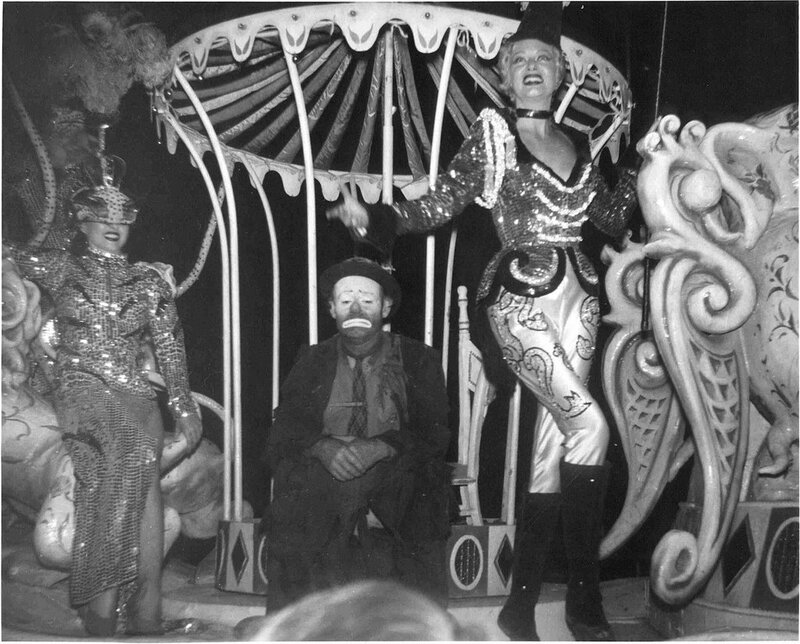 Emmett Kelly and Ann ( I don't know if Ann is the woman on the left or the right. 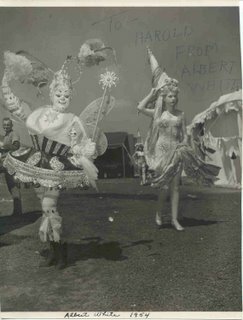 All we know is that one of them is named Ann) riding a float during the 1951 spec. 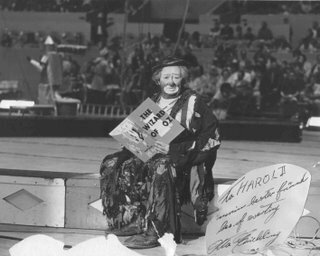 Bill Hall and Dom Yodice were kind enough to identify Anne Mace as the woman on the right. 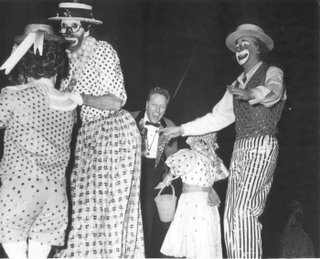 Dom also notes that they are not on a 1951 float. 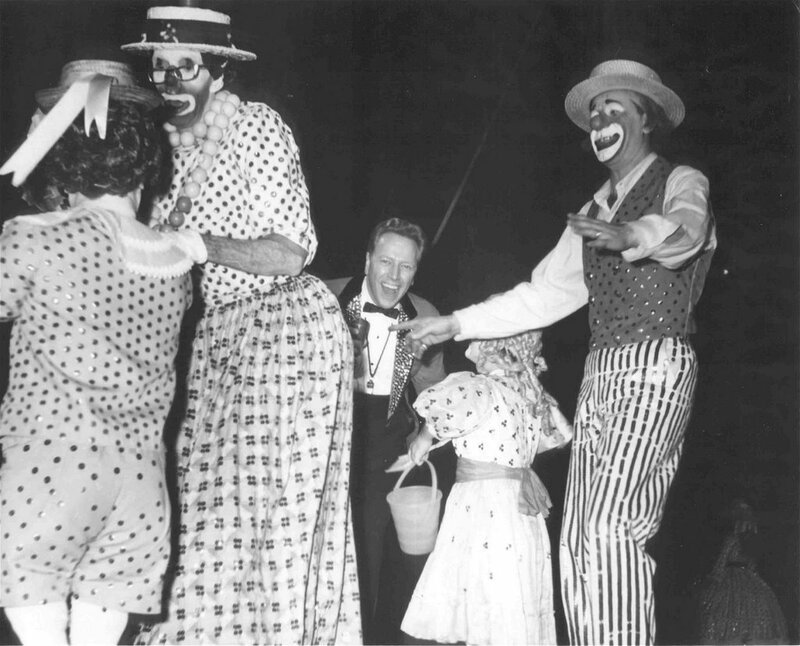 This is the "Payoff" float from the 1954 spec "Dreamland". From left to right: Albert "Flo" White (back to camera), Gene Lewis, Harold Ronk, Prince Paul Albert (face obscured) and Michael "Coco" Polakovs without his trademark baggy suit and sailor's cap, looking pretty sharp in his straw boater. Whoever said that circus performers never sit on the ring curb facing out must have forgotten to tell Otto as he sits down to read the L. Frank Baum classic and kick off the Wizard of Oz spec in the late 60s. 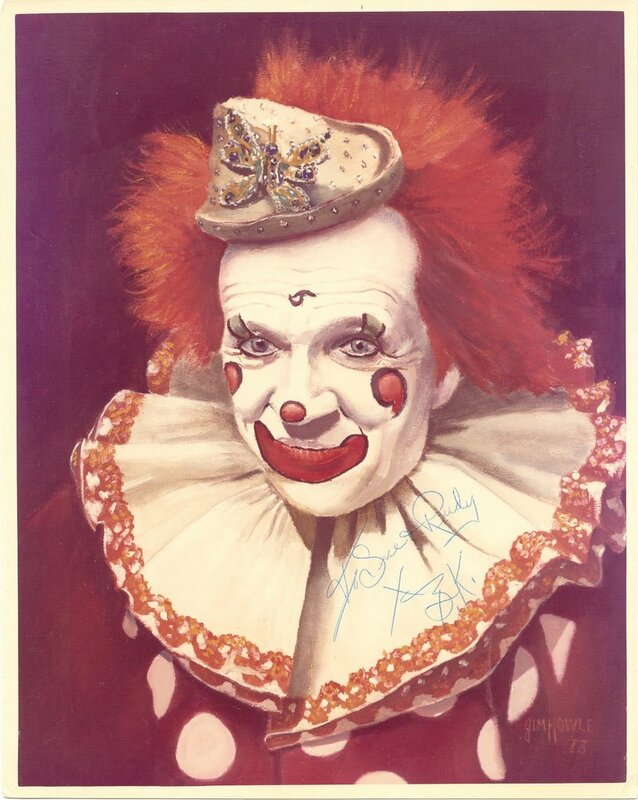 The photo is personally autographed from Mr. Griebling to Mr. Ronk. 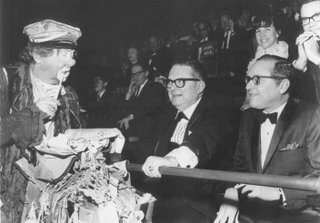 Otto meets the new bosses; Judge Roy Hofheinz seems to be reasonably amused by Otto Griebling, one the greatest circus clowns of the 20th century. Irvin Feld looks slightly uncomfortable. Maybe the Judge was laughing so hard he spilled some of his Dr. Pepper on him. Well dressed crowd though, all the dads in slick looking 60s narrow-lapelled suits and skinny ties. From everyone's thick black eyeglass frames I would have to guess that this picture was taken on "NASA Night" and the show was playing at Cape Canaveral to celebrate the impending moon landing. Or maybe it was "Buddy Holly Look-A-Like Night" at the Garden? 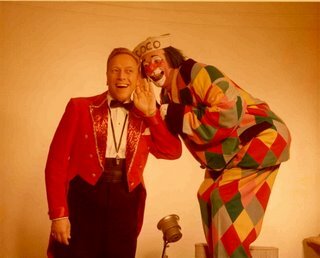 Although dated 1978 I believe this photo of Mark Anthony is more likely from 1968 from both the way the colors have faded as well as the fact that Frankie Saluto is visible in the background. 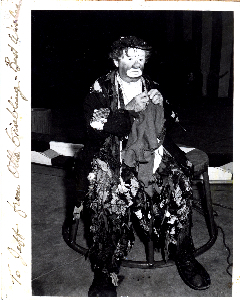 Bill Strong answered a longtime question of mine when he sent this photo of Johnny Day. I'd seen a picture of Johnny a few years ago and wondered if it was Harry Dann or one of his numerous imitators but no one seemed to know anything about a clown with a Harry Dann-like makeup with a question mark in the center of his forehead. 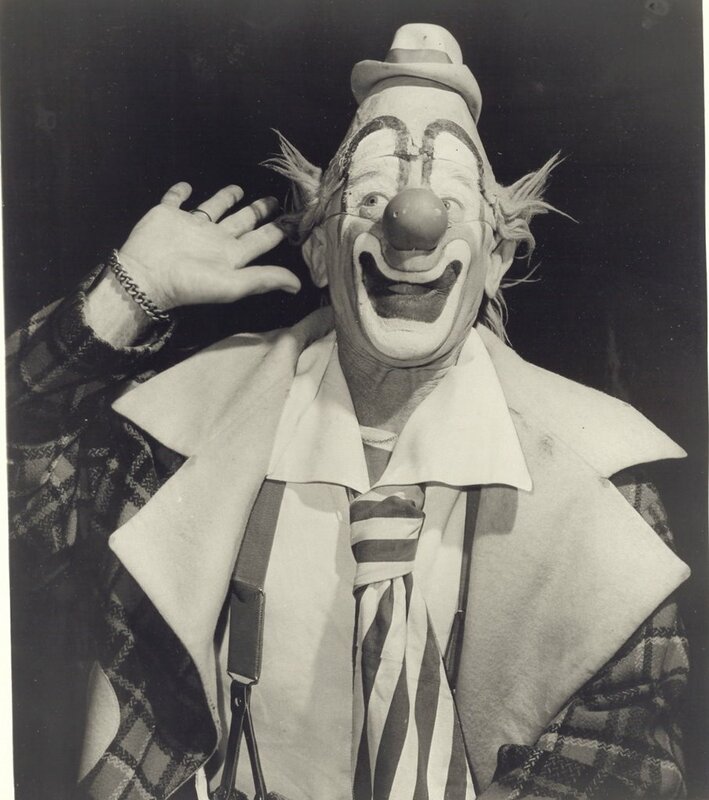 Seems Mr. Day combined the makeup of Harry Dann with the sparkled nose and center-of-the-forehead insignia of Ernie Burch's "Blinko" makeup with Albert White's eyebrows thrown in for good measure. 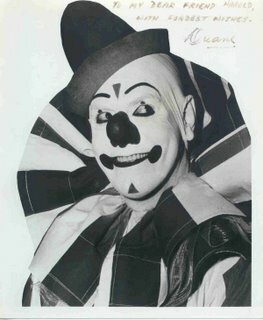 Eddie Dullam also used puncuation in his makeup: an exclamation mark in the center of his forehead. Eddie's makeup was an exaggerated adaption, but not an outright duplication, of Harry Dann's classic face. 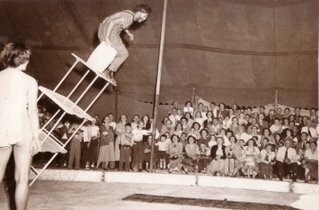 "I feel this must be early in Dime's Table Rock career, he's only using 3 tables, and doing the fall forward is a lot more dangerous. At one time Dime spent months with his jaws wired shut when his tables buckled and he came down on top of them. He was doing the normal rock backwards at that time." From the estate of Harold Ronk (now in the collection of Robin Estes) comes this 60s-era autographed photo of Duane "Uncle Soapy" Thorpe. 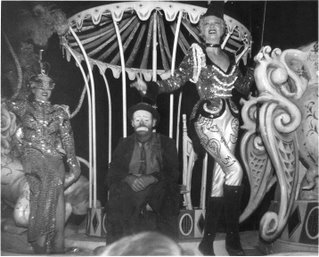 Also from the personal estate of legendary Ringling ringmaster Harold Ronk comes this publicity photo of Mr. Ronk and Michael "Coco" Polakovs. 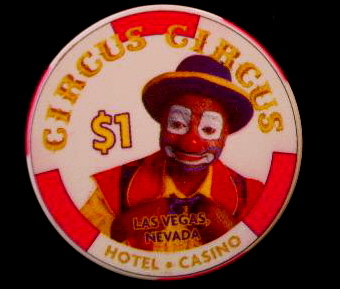 After a remarkable run of, I believe 16 years on the Ringling show, Mr. Huel Speight has enjoyed an almost equally long run at Circus Circus Hotel & Casino in Las Vegas. 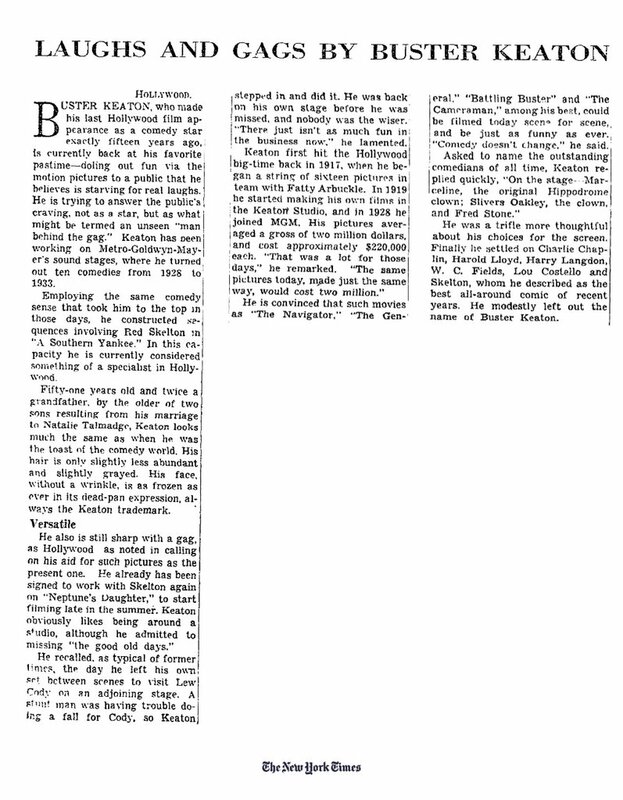 A New York Times article on Buster Keaton from about 1945-46 when he was a gagman at MGM for folks like Red Skelton. 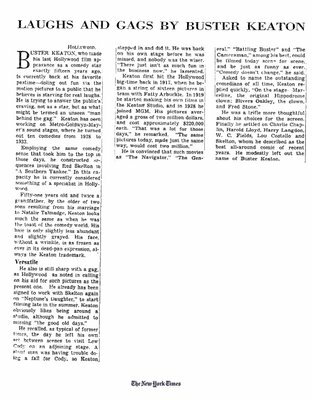 Of particular interest is the 2nd to last paragraph where he is asked who he thought were the outstanding stage comedians of all time. He lists Marceline Orbes, Slivers Oakley and Fred Stone. 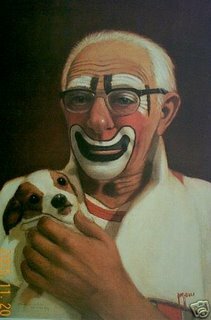 In his autobiography he singles out Poodles Hanneford as the absolute best comedy acrobat he ever saw. Remember, Buster grew up in show business and worked with and watched EVERYBODY! 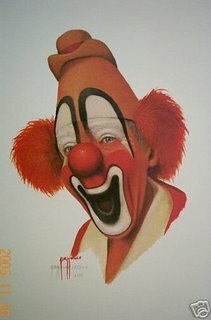 High praise for the clowns and their craft from the undisputed master of physical and visual comedy. 30 minutes with Adrien Wettach...the legendary M. Grock. Buster Keaton in a scene from his final silent feature, SPITE MARRIAGE (1929). Here Buster's wife (Dorothy Sebastian) has passed out drunk and he attempts to move her unwieldy, uncooperative body and put her to bed. 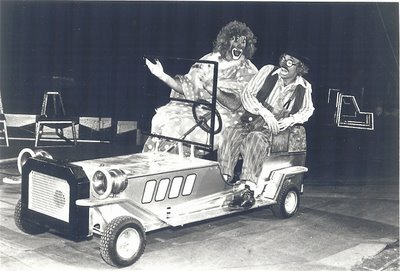 This scene was later reworked and performed by Buster and his wife Elenor when Buster clowned in the ring of the Cirque Medrano. 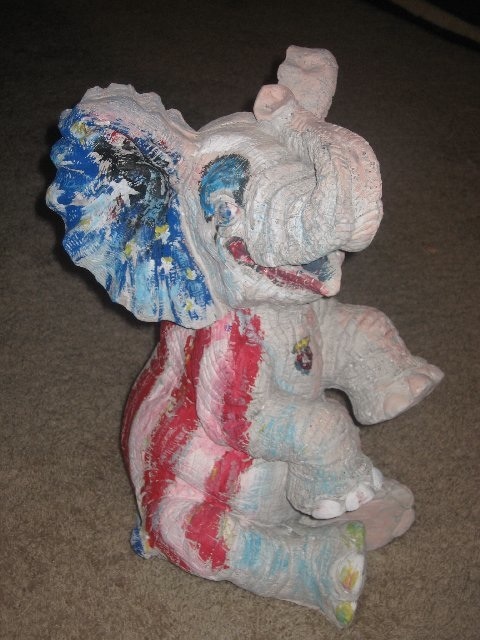 This elephant would not have looked out of place on Irvin's big Bicentennial tour. I can only imagine how the Mehron or Krylon people would have responded to the makeup order though. 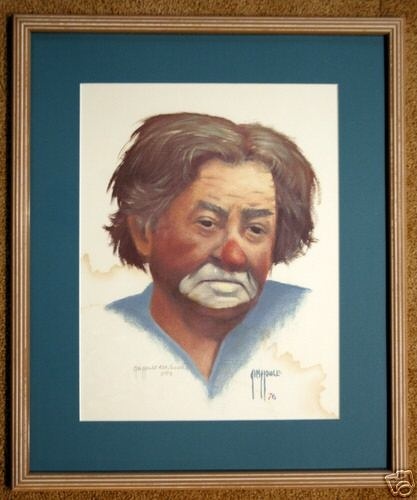 Bobby Kay Smiley as seen through the eye, tools and talent of Mr. Jim Howle. Early Clown College graduate and former Ringling clown Jim Howle's portraits od Lou Jacobs in full makeup and Lou outside the ring playing with Knucklehead. 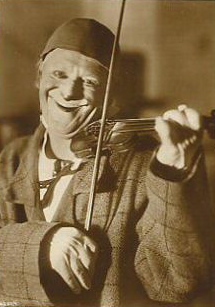 Jim Howle's depiction of Master Clown, Otto Griebling.